Strong family and faith: Belinda Goodwin (back second from right) with her husband David (beside her) and children (back from left) Samuel, Thomas, Gretel and Emma; and (front) Sarah, Charlotte, Lily, Maximilian and Lucy; and (inset) Belinda with daughter Gretel. PERHAPS it’s the formula of the absence of a television screen, one stereo in the living room and school-related computer access only. Perhaps it’s the fervent commitment to Catholic traditions and the pursuit of prayerfully following the will of God. Or it could well be the unwavering dedication to the nine children within their household and the further four entrusted to God’s care. Undoubtedly, for Brisbane’s Belinda and David Goodwin, it’s all of the above and more. In the years since The Catholic Leader broached the topic of losing their ninth child, Ignatius, at nine weeks’ gestation, the resilient duo have continued to be steadfast to the faith of their ancestors while effectively “turning off” the secularised world around them. “Our children aren’t without their faults,” the mother to Thomas, 17, Emma, 16, Samuel, 14, Charlotte, 13, Lily, 11, Sarah, 9, Lucy, 7, Maximilian, 5, and Gretel, 2, said. “(But) they don’t care about peer pressure … (and) the biggest problem I have is them staying up late talking every night. The Goodwin brood has long accepted the “no television, video games, smart phones, tablets or personal musical devices plus limited computer access” rule. Belinda, a doctor and pro-life advocate, said they committed to resist the “modern-day pressures to give children devices” but remain in the real world. “The older children have email addresses, mostly for school work,” she said. “(And) except for Tom, who’s finished school, the other children are not on social media. “Devices can be damaging and dangerous, and are simply not required. “Without a TV, the children don’t see many of the immoral ways people live and, instead, spend their most formative years being instructed by us in what is right and wrong. Having completed schooling at Brisbane Christian College last year, Thomas works and and studies Liberal Arts. “Tom’s a great example to the other children,” the 43-year-old mum said. “He’s grown into a man of character and strong morals, and David and I are so proud of him. Thomas is godfather to his youngest sister Gretel, whom Belinda and David welcomed in 2017 and she described as their “beautiful little miracle”. The other children were well occupied with “a combination of study, violin, dance, rugby league, debating and after-school activities”, Belinda said, and their free time was spent “playing outside, reading a book or talking and playing games”. A home library with “a great selection of books” is key to their amusement and knowledge acquisition. So too are peer relationships with “young people of good character”. “I often say to them that the worst thing one can do is to see wrong in the world and do nothing about it,” Belinda said. Within this notion of strongly held beliefs and customs, she was open to sharing ways of helping their growing teenagers understand real-world realities through the lens of faith. It’s a “not as you say but as you do” attitude that pervades her mothering. “I need to provide a living example of what is right,” Belinda said. “From the way I dress, to the way I speak, to the way I stand up for the issues that count. “Our children attend Mass, pray the Rosary with the family daily, regularly attend (the sacrament of) confession and visit (Jesus in) the Blessed Sacrament. While she knows their children aren’t perfect, Belinda said neither was she. “I pray for God to help me to be a better mother and wife regularly as I do have my faults,” she said. “I’ve made it a habit to pray for God’s will in my life and in the life of my family … for in doing God’s holy will, that’s when we’ll be the happiest. 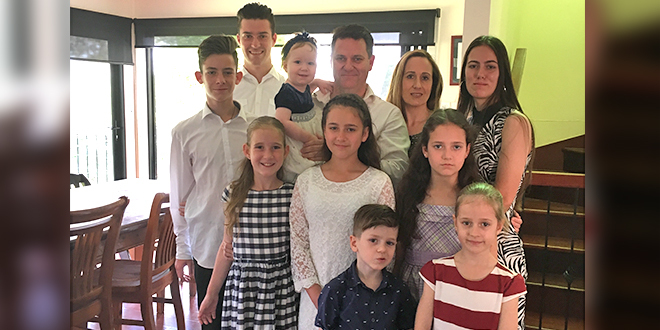 Finding her “strength” to raise nine children and accept the loss of four in utero, knowing she’d “have twenty more” if she could, a bout of acute pancreatitis just after Gretel’s birth put her limits into perspective. David, with whom she marks 20 years of marriage in December this year, continued to be her rock during recovery, as was her faith in God, His Church, in Mary, the Mother of Jesus, and the saints. The family has continually offered intercessory prayer to St Philomena, and David, even as a child, had a special devotion to St Joseph. “My strength to be a mother and wife lies firmly in Christ and Our Blessed Mother Mary and the teachings of the Holy Catholic Church,” Belinda said. “A priest once told me, when I was busy with quite a few young children and I wasn’t achieving all that I wanted to do, that my vocation was motherhood and that I needed to focus on my children and raise them in the faith.